The backyard landscape design is based on Japanese principles of simplicity and harmony, working with the natural contours of the property and using mostly plants that might be found in gardens in Japan. The design was created by my mother Robin, myself, and my wife Rosemary. I did all the labor except for placing the boulders and building the engawa-style wood deck. From the engawa, a large tutsi-nugi-ishi ("stepping down stone") and stone paths lead to two patio areas. Starting in early 2002, I first removed 400 sq. ft. of concrete patio and then had all old plantings and lawn removed. New soil was brought in to extend the bank on the far right (the neighboring lot is 5 ft. higher than ours) and to create low mounds at the rear along the fence line. The next step was planning and positioning a dozen large boulders, many of which went into creating a water feature area. 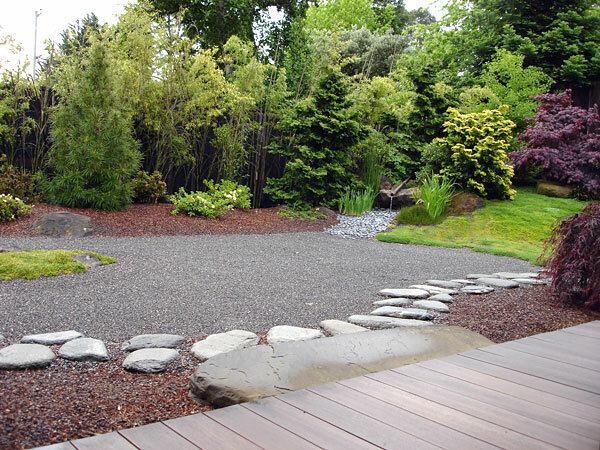 The central area of fine raked gravel replaces the traditional lawn. It has proven to require far less work to maintain than a lawn. Plants shown in the photo include black bamboo, Japanese umbrella pine, azealeas, Hinoki cypress, Japanese iris, Ginko (far right corner), and Japanese maples (far right).